The Kimberley Process (KP) was supposed to prevent the trade in diamonds that fund human rights violations. However, The KP’s narrow definition of a “conflict diamond” excludes cut and polished diamonds. Jewellers exploit this anomaly, deceitfully claiming diamonds crafted in Israel are conflict free despite the UN Human Rights Council having found Israel guilty of war crimes and possible crimes against humanity. Diamonds crafted in Israel cannot be distinguished from other diamonds. Unless a diamond is laser inscribed to identify where it was crafted or the jeweller can provide documentary evidence of where it was cut and polished, there is a high risk of buying an Israeli blood diamond. Israel’s leading exporters of Diamonds are Leo Schachter ( includes Leo Diamonds as sold in Ernest Jones ) and Lev Leviev Diamonds. Don’t buy a diamond unless you know where it was cut and polished. In Dec 2011 the British Jewellers Association(BJA) directed jewellers to take “every reasonable precaution to prevent [Zimbabwe] Marange diamonds [which are also exempt from the KP definition of conflict diamond] entering the UK supply chain." Yet in 2010 Israel’s net export of diamond was worth 25x Zimbabwe’s total diamond export. Why the double-standards? 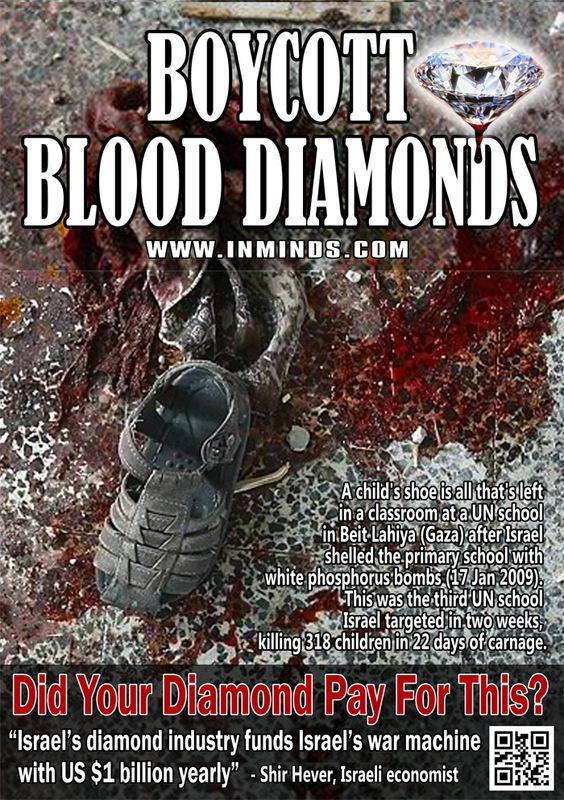 Write to BJA Chief Exec, Simon Rainer (simon.rainer@bja.org.uk), ask why is he ignoring Israeli blood diamonds. 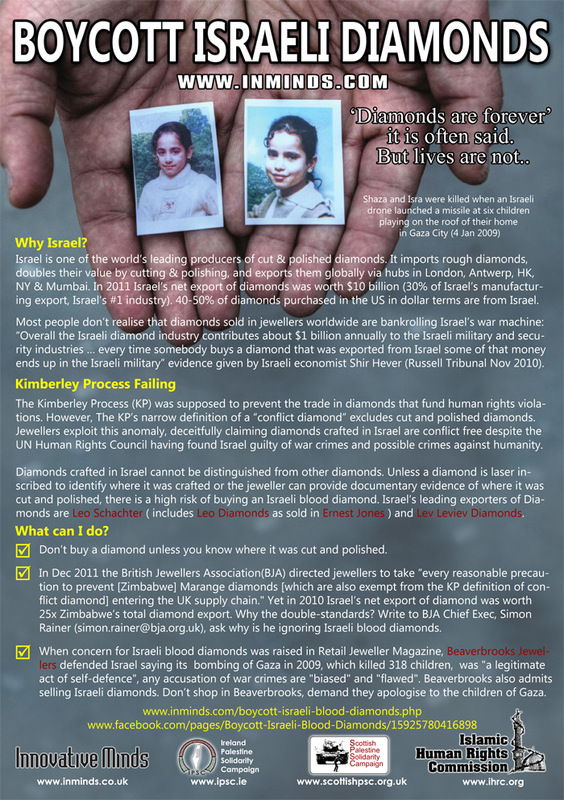 When concern for Israeli blood diamonds was raised in Retail Jeweller Magazine, Beaverbrooks Jewellers defended Israel saying its bombing of Gaza in 2009, which killed 318 children, was "a legitimate act of self-defence", any accusation of war crimes are "biased" and "flawed". Beaverbrooks also admits selling Israeli diamonds. 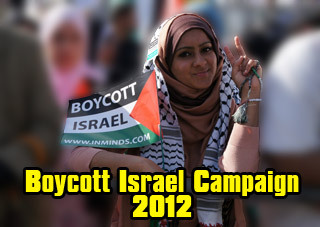 Don’t shop in Beaverbrooks, demand they apologise to the children of Gaza. The Steinmetz Company supports the Givati Brigade of the Israeli army through charitable donations. Sotheby's through its partnership with Steinmetz Diamonds is directly linked to Israeli war crimes in Gaza. Protest outside Sotheby's Thu 11th July 2013, 1:30pm. On 27th March 2013 human rights activists protested outside Sotheby's in London for their complicity in the funding of war crimes, including the Samouni massacre in Gaza in 2009, through their partnership with Steinmetz Diamonds company. The Steinmetz Company supports the Givati Brigade of the Israeli army through charitable donations. Sotheby's through its partnership with Steinmetz Diamonds is directly linked to Israeli war crimes in Gaza. 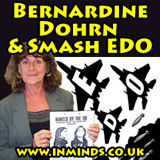 Protest outside Sotheby's Wed 27th March 2013, 12:30pm. Protest outside the Tower of London on 26th Aug 2012 demanding the Steinmetz Israeli blood diamond be removed from display at the Tower, Steinmetz sponsors the Israeli Givati Brigade which is responsible for the massacre of the Samouni family in Gaza. Join the protest against Samouni massacre blood diamond in Tower of London on Sunday, 26 August 2012, 3-5pm. Human Rights activists protested at De Beers in London over its display of an Israeli blood diamond in the Tower of London. The Forevermark blood diamond was crafted by De Beers partner, Steinmetz which is complicit in the massacre of the Samouni family in Gaza. Your Majesty Say No! To Israeli Blood Diamonds In The Tower! In the third protest in three weeks, human rights activist on Sunday 1st July 2012 gathered outside the Tower of London asking the Queen to remove the Steinmetz blood diamond from the De Beers Jubilee display at the Tower of London. For the second consecutive week human rights activists converged on the Tower of London to protest the De Beers display of the Steinmetz Blood Diamond after revelations emerged of Steinmetz's funding of massacres in Gaza. Following an appeal from the surviving members of the Samouni family, activists protested the Steinmetz blood diamond on display at the Tower of London. Steinmetz funds the notorious Givati Brigade of the Israeli Army which is guilty of the massacre of the Samouni family.